For those not interested in laser tattoo removal, but are wondering about tattoo designs and what type of tattoo to get then the resources below are a must. Do not commit to a design until you have consulted the huge galleries and tattoo resources below. It is well worth the investment for something you plan to have for life. Laser tattoo removal or tattoo fading and other tattoo removal techniques are becoming more popular these days. What seemed like a good idea many years ago, may not be now after we have aged and our skin has aged. The popularity of tattoos is growing. With the increase in the number of people getting tattoos, there is also an increase in the number of individuals removing tattoos. Chopper-Tattoo - Huge Tattoo Gallery! The #1 Tattoo Gallery On The Web. Looking for useful tattoo information? The TATTOO SKIN CARE ebook available from healthy-skincare.com has all the information you need. Before discussing laser tattoo removal and removing tattoos in other ways, a little background information might be useful. A tattoo is writing, a design, or a picture, etc. that is drawn in the skin with a pigment or ink. The pigment is inserted into the dermis layer or second layer of the skin through small holes in the skin’s top layer or the epidermis. Nowadays, the tattoo is achieved by using an electric tattoo machine. This machine contains needles that rapidly move in an up and down motion, puncturing the top layer of the skin and injecting the ink or pigment underneath in the dermis layer of the skin. The drawing was once considered permanent because the pigments used are very stable to fading and degradation within the body. In addition, the cells in the second layer of skin are very stable, much more stable than the cells on the surface of the skin. Therefore, the ink or pigment of the tattoo remains for the individual’s lifetime. If interested in tattoo designs, then this link, tattoo lettering and tattoo designs gallery is a must to consult. Or you if prefer tattoo designs is a great tattoo resource for all your tattoo needs. As the number of people with tattoos grows, so does the desire to be able to remove these so-called permanent drawings. Therefore, a variety of techniques such as laser tattoo removal or tattoo fading were developed. Tattoo removal techniques and the effectiveness of such techniques varies in each individual case. In many situations after removing tattoos, some scarring or colour variations remain on the skin, depending on several factors. Generally, these factors are the size of the tattoo, which ink was used, its location and depth in the skin, how long the individual has had the tattoo, and how the patient heals. For example, tattoos that have been applied professionally are usually deeper in the skin and at a more uniform depth. This potentially makes tattoo removal more likely to succeed than perhaps homemade tattoos, where the depth into the skin is a lot more variable. In addition, newer tattoos are usually easier to remove than older ones. Therefore, several factors are responsible for determining whether a tattoo can be removed completely or not. The preferred, most common, and probably best method for removing tattoos is laser tattoo fading. This procedure involves the use of short flashes or pulses of high energy light that are directed at the tattoo. These light pulses penetrate the top surface of the skin without damaging it and are at the right wavelength so that only the targeted tattoo pigment absorbs the light. Depending on the colours used in the tattoo, different lasers are required. The easiest colours to remove with the laser treatment are blue and black, whereas yellow and green colours are the most difficult to remove. When the various tattoo pigments absorb the high-energy pulse of light, they are broken down into smaller particles. In this smaller state, the pigment fragments are then removed by the body’s immune system over a period of a few weeks and the tattoo fades. Why is laser removal of tattoos the preferred technique? Laser tattoo fading is less painful than other techniques, it is a procedure with no bleeding, low risk of scarring, it is effective, and has only minimal side effects overall. These side-effects may include redness, mild swelling, tenderness at and around the treated area, crusting of the skin, or a lightening of the skin. The patient who has had laser tattoo removal usually feels a sunburnt sensation shortly after treatment. The procedure is preformed on an outpatient basis and anesthetic may or may not be required. Usually a numbing cream can be used before treatment in order to lessen any discomfort that the patient may feel. The sensation without any anesthetic compares to being hit with a stretched rubber band. A series of treatments is necessary to complete the laser tattoo removal. Each successive treatment usually requires a break of 4 to 6 weeks in order to allow the skin to recover and the tattoo to fade from the previous treatment. Amateur tattoos generally require 2 to 6 laser treatments, whereas professional ones can take from 6 to 10 treatments. There are three types of lasers used. 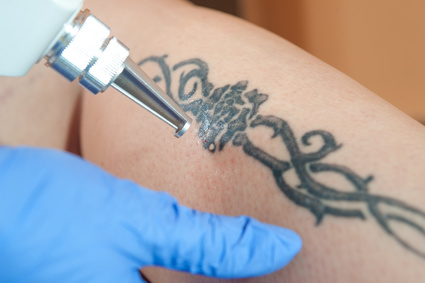 Older tattoo removal methods using infrared and argon and carbon dioxide lasers were less effective and often led to scarring in a large number of cases. Other tattoo removal techniques can be found at the other tattoo removal methods page.